The chances are that lunch culture in Finland is different to your country. 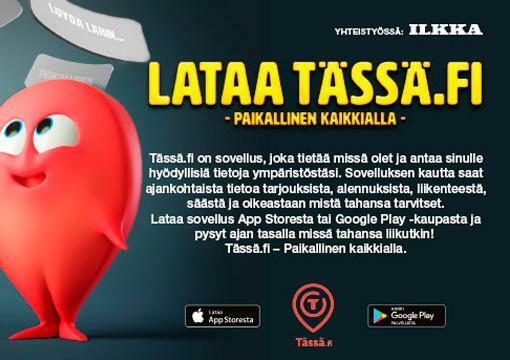 For those working in Finland, the lunch break is normally 30 minutes, meaning you want to get in, eat and get out pretty quickly. Many cafes and restaurants cater for this by offering a lunch buffetti, a self-service buffet lunch where you pay upfront and take what you want. In the UK, for example, this is often marketed as ‘eat what you want’ and it seen as a challenge! In Finland, similar rules apply, although it isn’t marketed the same way. 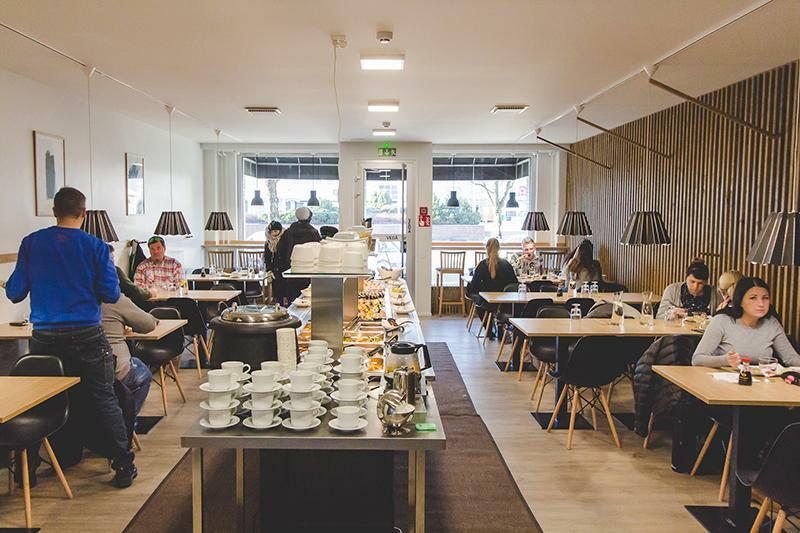 There are many places in Seinäjoki offering a lunch buffet (sometimes described as lounaspöytä) of hot food and salads usually including a dessert and coffee. You will also find food from around the world, as well a local dishes. You should expect to pay between 8–10€ for lunch and remember, once you’ve paid, don’t be shy in going back for seconds of your favourite dish. Äärellä – fine food at lunchtime, Äärellä offers a simple daily menu of three locally-produced dishes. You will pay 10€ for one dish followed by coffee, and it will be worth every cent. 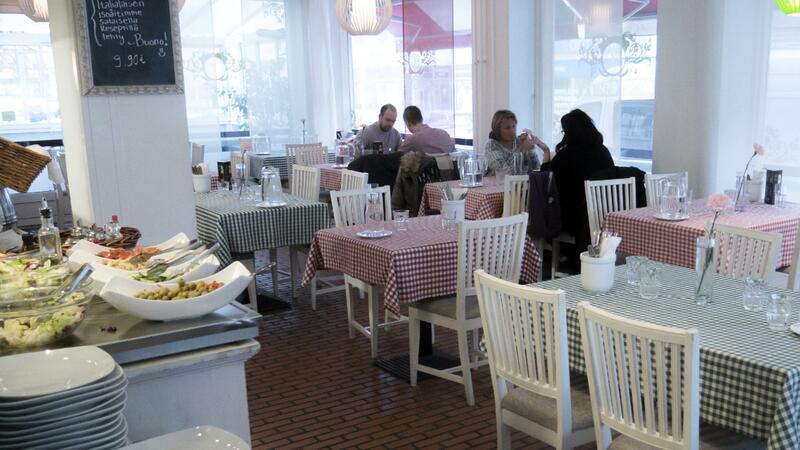 Sininen Paprika – Greek food, cozy atmosphere and check out the non-matching crockery. Plus meat pihvit (patties) that are legendary in Seinäjoki. Ravintola Juku – the best selection of Sushi in town, it gets busy at lunchtime but they just doubled the size and added a terrace, so you should get a seat. Turkinpippuri – a must a lunch or dinner time for their Jätti (giant) pizza. Trust me, 25€ for a pizza that will feed 6-8 people is a bargain. Mangal – an authentic taste of Nepal in Seinäjoki, and particularly good value at lunch time. Finland is the biggest consumer of coffee per capita (9.6 kg per person annually or 2.64 cups per day) and the fourth biggest consumer of ice cream per capita (14 litres per person annually). With that in mind, what better way to embrace the Finnish lifestyle, than to indulge in both. Daily, if possible. You will find many ice cream kiosks around the towns and villages, as well as the beaches. Many of the cafes and restaurants also have a good supply. One unusual quirk that you might want to try out is one of the Pehmis Paikka, this translates as ‘Soft Place’ and is simply an ice cream van in a lay-by of a busy road, but it is not unheard of for a family to drive 15 mins out of town for pehmis (soft-whip ice cream) at the pehmis paikka. Kauppatori – situated outside the Torikeskus shopping centre, Kauppatori (market) is a regular destination for many Seinäjokiläiset to indulge in ‘tori kahvi’ from one of the outdoor kiosks. If the weather is good there’s no better place for catching-up with friends or just people-watching. Valkoinen Puu – a newcomer to Seinäjoki. A fair selection of coffee, but an amazing selection of home-made cakes, usually sold in HUGE slices. Also offers soup, salad and slices of pie for lunch. Vohvelihetki – not only ice cream, but delicious sweet and savoury waffles. Also a good idea for something slightly different for lunch. 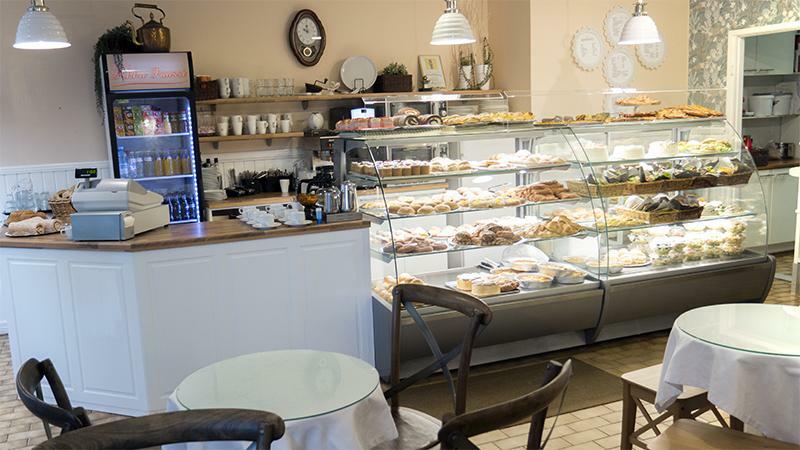 Pikku Paussi – This is a lovely little coffee shop, traditionally styled with a good selection of pastries, plus soup, pizza slices and salad and filled rolls for lunch. Can get busy but offers plenty of outdoor seating in summertime. 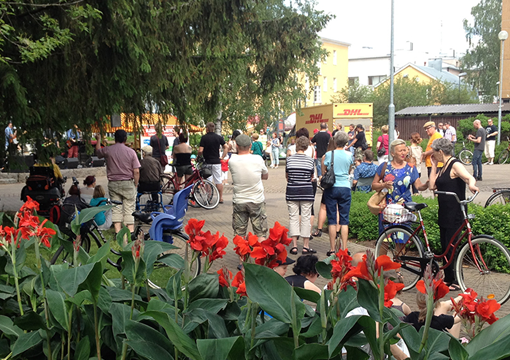 Like most towns, there are many places to have a drink in Seinäjoki but, as we’re looking at summer tips I thought I’d look at the best places for outdoor drinking. From early-May, many places add a small, wooden terrace outside their bar so you can enjoy a drink in the bright evening light (and a smoke if you’re so inclined). Take note, you cannot take drinks outside of these terraces onto the street, so don’t be surprised if a burly bouncer stops you walking-off down the street with you drink in hand. Mallas Kabacka – only a small bar with a small terrace, but Kabacka has a relaxed, cosy vibe, excellent fresh ‘street food’ and one of the best selections of beer in town. There are various evening entertainments organised and it is the home of the popular British Pub Quiz. Still Standing – another small bar but a bigger terrace. Run by Momo from Morocco and one of the more cosmopolitan bars in town, popular with international visitors, students, SJK football fans and anyone with an open mind. Galaxie Center – if you like a bar to offer more entertainment, this is the place for you. Snooker, American pool, darts and a curling table can be found downstairs at Galaxie Center for approx 10€ per hour. The terrace may face the car park, but it also catches the sun well into the evening. 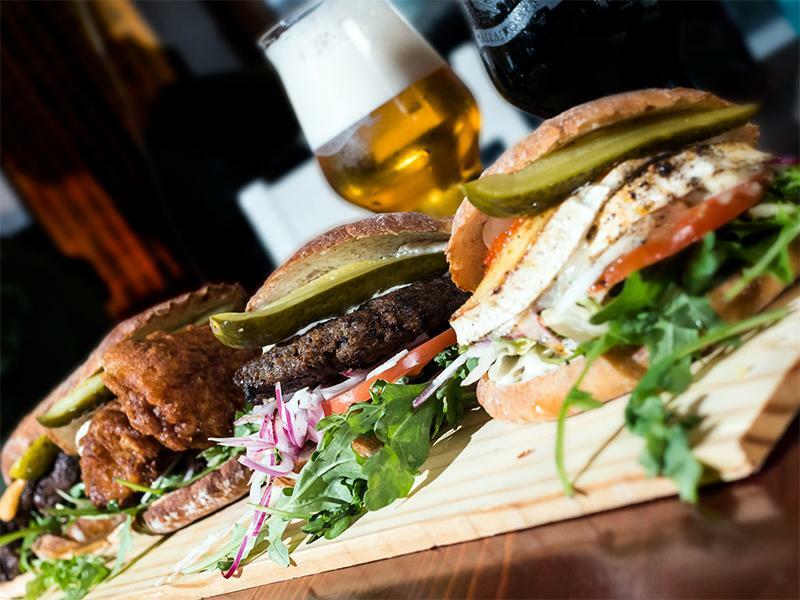 Pub Wilson – claiming ‘best-looking, sunniest terrace in Seinäjoki’ Wilson is a sports bar with two large TV screens for watching both Finnish and international sport, plus a varied menu of pub food. Kauppatorin Aalto – opened in summer 2016, this open-air bar is located in the Kauppatori market square. On a sunny day it’s perfect for taking in the sights and sounds of the various events or just watching the world go by, with a cold drink in your hand. While the weather is good, let’s continue with the al fresco theme. Of course, many of the bars offer bar food, but maybe you want something more substantial, so here are some of the best places for eating outside. I’ve been assured that it is pretty easy to find vegetarian food in Seinäjoki nowadays, so these should work for most people. Remember, leaving a tip is not compulsory or even expected, in Finland, but if the service is good then a tip will be appreciated, 10% would be just fine.